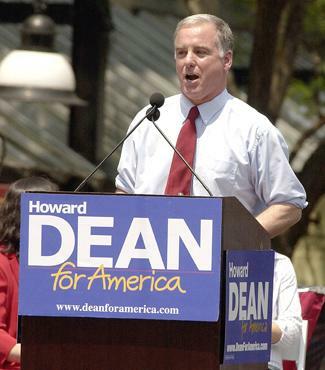 There was a time when Howard Dean, a former governor of Vermont who was also a practicing medical doctor, not only looked like the most electrifying politician on the planet, but also quite possibly the next President of the United States. Dean was the ultimate candidate-as-stock-bubble, a man who, through his main strategist Joe Trippi, harnessed the power of the Internet for both fundraising and rallying base voters. While opponents John Kerry and John Edwards were mealy-mouthing about the Iraq war, Dean attacked President Bush and his war head on. It made him such a big star that even Al Gore endorsed him. Dean's bubble burst even faster than it grew, though. He suffered a surprising third-place finish in Iowa, and then, while rallying his supporters after the loss, he got a little too excited and unleashed his now-infamous "yeaaahhhh!" scream. In context, it's not nearly as bad as it seemed at the time. Regardless, painted as a doomed, potentially unhinged candidate, Dean's campaign was essentially over at that moment. Dean has done OK for himself, running the Democratic National Committee for a few years and now working as a consultant and TV pundit, but his campaign (and most notably, his ability to raise money over the Internet, a tactic Barack Obama used to put himself in the White House) will live forever in both fame and infamy. Especially because they made a movie about it. Well, not exactly. "The Ides of March," George Clooney's political thriller we reviewed here, is based off the play "Farragut North," which was written in 2008 by a man named Beau Willimon. Willimon, in 2004, worked for the Dean campaign, and even though he takes great pains to note that the play was fictional, he admits that the whole play was informed by his experiences working for Dean. It was his longtime friend Jay Carson who recruited Willimon to work on Dean's campaign. Carson was Dean's press secretary; Willimon worked on the advance team. And while Willimon says the play pulls from other campaigns he has also worked on, he admits to having an insider's view on Dean's. "I was getting stories from Jay (about) what was going on in the inner sanctum," he said. "From my ground level, in-the-trenches point of view, mixed with the sort of stuff Jay was telling me at the highest levels, I was able to witness how a campaign works. "The gamesmanship between the campaign and the press is a major theme of the play," he said. In the play, the presidential candidate bears more resemblance to Dean than he does in the movie, but there's a reason for that: You never actually see the candidate in the play. He's merely "the insurgent candidate." The candidate in the movie, played by Clooney himself, would never do a scream like that. Of course, Howard Dean never did a lot of the things the presidential candidate in the movie does either. And that, ultimately, includes coming close to becoming president: The campaign in the film is based in the Ohio primary, but Dean, despite all the states he listed in that video, never made it that far.